The information presented is for general purposes only and does not and should not be considered as the rendering of any legal advice. There is no attorney-client relationship established whatsoever by anyone who reads or otherwise uses or accesses this web site. Anyone who reads, reviews, receives or otherwise obtains information from this web site should not rely upon it as a basis for any decisions to be made by them of any kind whatsoever. Rather they should instead receive professional assistance if they deem it necessary. Any internet linkage to other web sites or the use of this web site concerning any matters is provided simply as a convenience to the user and visitor of the web site and is not an endorsement of any of the linked sites nor does Robert G. Lowe, III, Esquire, Robert G. Lowe, PL or rgllaw® attest to the accuracy and timeliness of any information otherwise provided in such sites. The forwarding of an e-mail will not constitute the commencement of an attorney-client relationship and therefore information of a confidential nature should not be sent since it would not otherwise be protected. Once an attorney-client relationship is formally stated in writing, then and only then will the attorney-client relationship be established. Any action including lawsuits, arbitrations, mediations, or other proceedings involving the use of this web site or arising there from or out of must be brought only in the circuit or county court in and for Pinellas County, Florida or the U.S. District Court for the Middle District of Florida, Tampa, Florida. © Copyright 2004-2019, Robert G. Lowe, PL, all rights reserved. 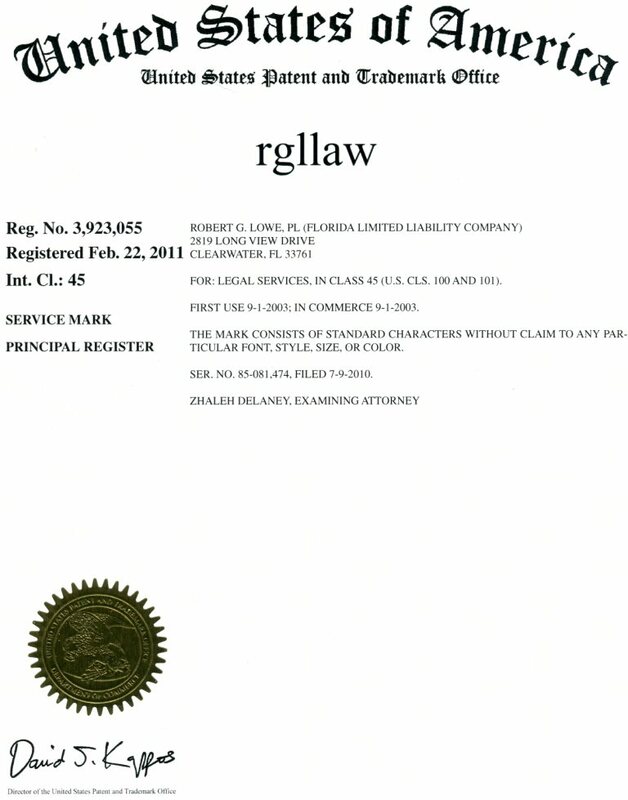 "Robert G. Lowe, PL" and rgllaw® are trademarks for legal services. This site was last updated February 2019.